← Who Cooks for You? Part Deux. About 40 neighbors attended the PGC’s 2nd neighborhood-wide meeting of the 2010-2011 season two weeks ago on March 10, 2011 at the Church of the Epiphany at Ponce and East Lake. 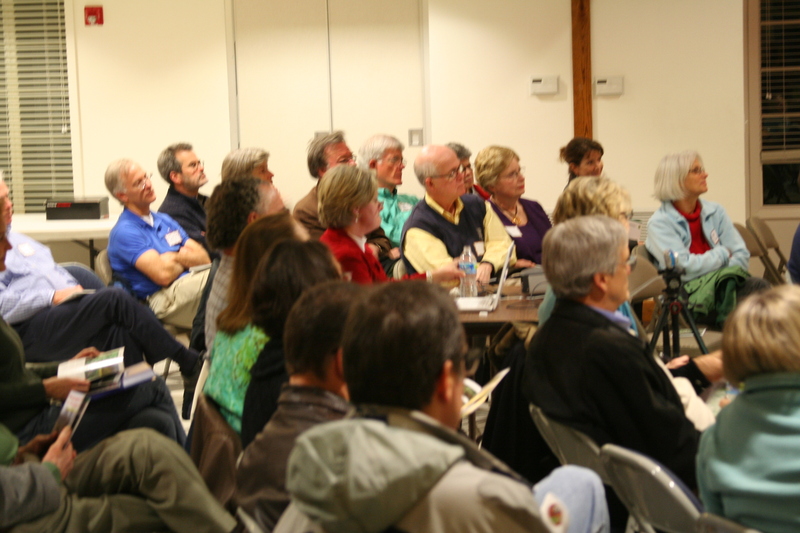 Five speakers presented talks for the neighborhood. The PGC and Park Committee thank all of the speakers and neighbors who made this meeting interactive, informative, and interesting. Between the presentations and questions from the audience that sparked discussion, the meeting ended up running almost 2 hours. 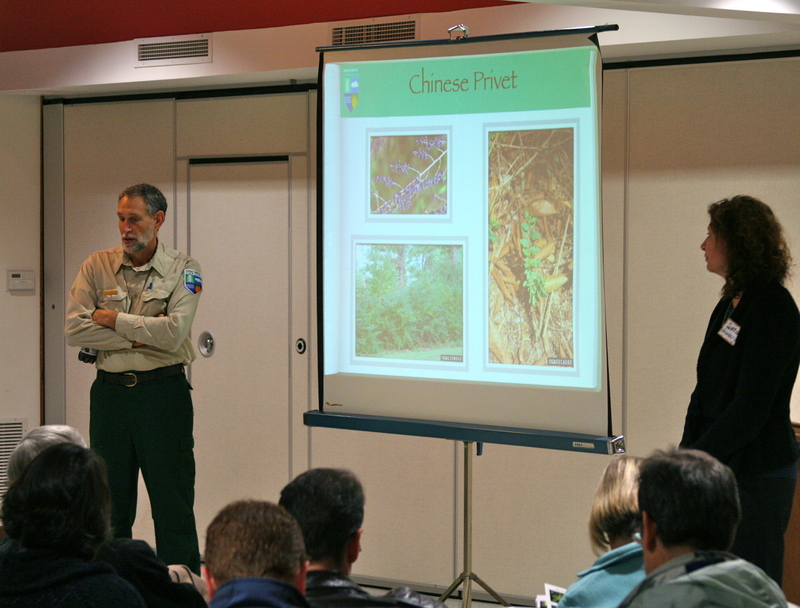 No one seemed to mind though — there was much to learn, much to discuss, and much to consider for the future of the Park. 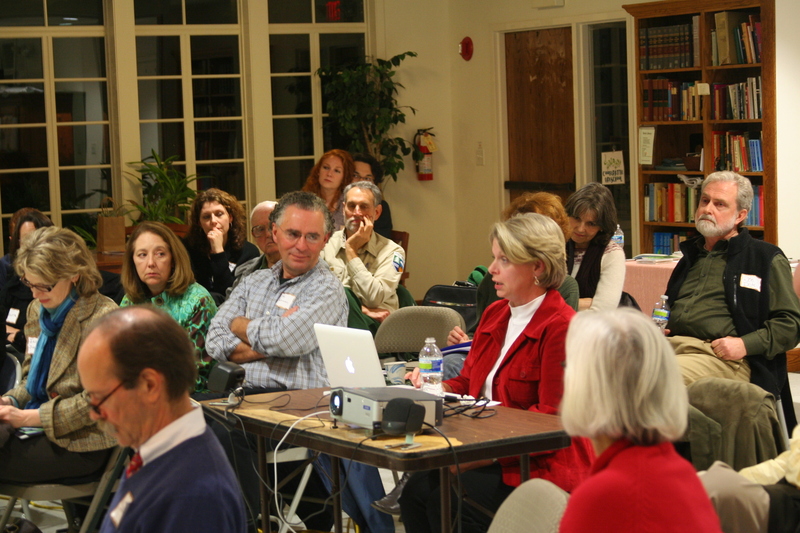 The best way to bring yourself up to date on Park issues if you missed the meeting is to read the meeting minutes, which are now available online in the Members Only section at https://parkwoodgardenclub.com/members-only/minutes-20110310/. You should have already received an email with the password if you are a PGC member, but if you need it again don’t hesitate to email me for it. The minutes contain links to Sheri’s Powerpoint presentation that you can either download as a .ppt file or view online in PDF format. The minutes also contain links to 40 minute videos of both the Nov. 4, 2010 and March 10, 2011 meetings. The minutes themselves contain summaries of each speaker’s talk. One of the take-home messages of the meeting is that the Park Committee needs to create a mission statement that will describe how we want to use the Park in the future. In addition to a mission statement, our biggest challenge now is to learn exactly what options we have for the Park. Many ideas currently exist for the direction the Park could or should take. One of the Park Committee’s tasks over the summer is to understand our options for the best overall use of the Park, any issues we need to resolve within the Park, and any limitations on usage we may have. The Park Committee will also need to explore potential sources of funding and consider the maintenance time and effort required by various usage scenarios for the Park. The Park Committee is in need of volunteers to help with fundraising, grant identification and writing, publicity, and 501(c)3 by-laws and filing. 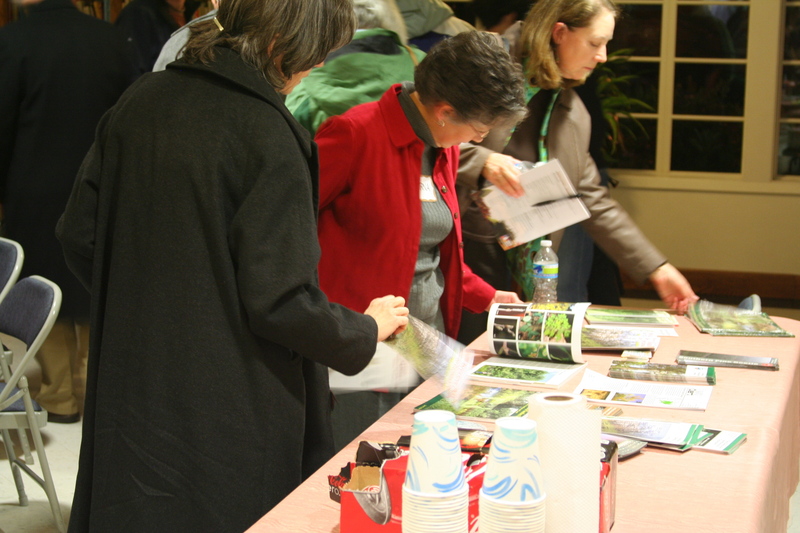 We’d also like volunteers to help with plant and bird identification, water quality testing, and photography. Any neighbors who have experience in these areas and extra time to donate, please contact Sheri Kennedy. 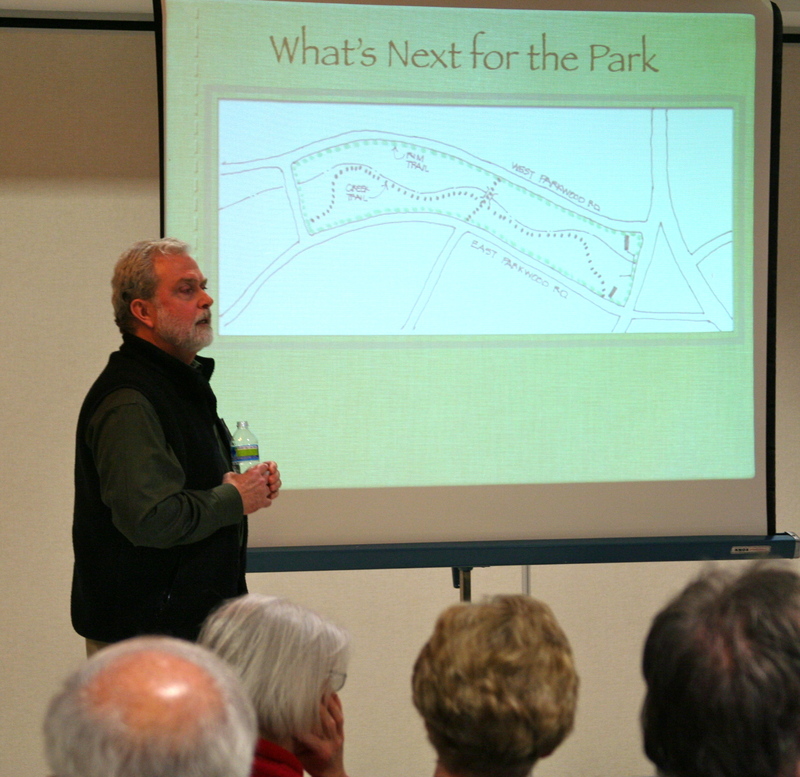 If you have questions or comments regarding Parkwood Park, please take a look at the various presentations and talks linked to above, and contact Park Chair Sheri Kennedy at sojpk@bellsouth.net. The Park Committee would like to thank neighbor and volunteer Park consultant Susan Stewart for her Powerpoint help and for taking minutes of the meeting. Thanks also to Committee members Steve Elmore for taking these photos, Karna Candler for welcoming attendees, and PGC Treasurer Beverly Greene for providing the cookies.